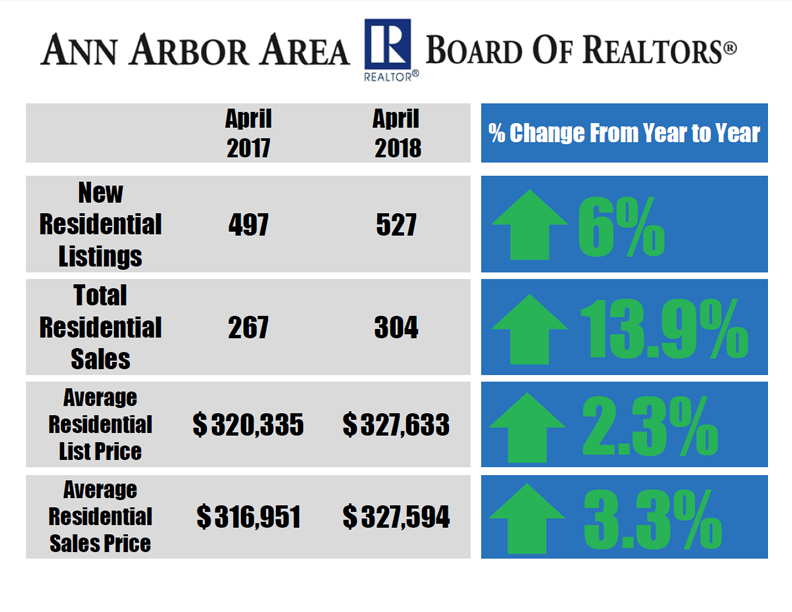 The number of new residential listings and residential sales are finally up after several consecutive months of declining numbers, according to data released by the Ann Arbor Area Board of REALTORS®. The number of new residential listings is up 6% from 497 new listings in April 2017 to 527 new listings in April 2018. Total residential sales are also up 13.9% from 267 sales in April 2017 to 304 sales in April 2018. The number of residential sales have not gone up year over year since November 2017. The average residential list price is up 2.3% from $320,335 in April 2017 to $327,633 in April 2018. Average residential sales prices are also up, with the average sales price being $327,594, 3.3% higher than in April 2017. In addition, 16% of homes were sold at list price in April 2018 and a staggering 44% of homes were sold above list price. Though the number of new listings are up for April, inventory still remains tight compared to 2017, with 7.3% fewer new listings year-to-date than at this point last year. NAR Chief Economist Lawrence Yun comments on the housing market's lack of inventory saying "healthy economic conditions are creating considerable demand for purchasing a home, but not all buyers are able to sign contracts because of the lack of choices in inventory. Steady price growth and the swift pace listings are coming off the market are proof that more supply is needed to fully satisfy demand. What continues to hold back sales is the fact that prospective buyers are increasingly having difficulty finding an affordable home to buy." To see more Ann Arbor Area housing statistics, view the April 2018 Housing Statistics Report.